Spatial variation in the fish community of the regulated Raia stream (Portugal) was examined during the summer of 1995. Variation in the native fish community (abundance of species-size combinations) was explicitly related to both the abundance of exotic species and habitat variables. The fish community changed in space from assemblages characterised by the high relative abundance of Leuciscus pyrenaicus, Leuciscus alburnoides and the smaller size classes of Barbus bocagei (all Iberian endemics with total length, TL, < 100mm to assemblages characterised by the high relative abundance of Chondrostoma polylepis (Iberian endemic) and B. bocagei with TL > 200 mm and of exotics Micropterus salmoides and Lepomis gibbosus (> 100 mm TL). The former assemblages used shallow sites far from downstream dams with some current whereas the latter assemblages used deeper sites closer to downstream dams without current velocity and with abundant floating macrophytes. Both exotic species and habitat variables were significant correlates of endemic assemblage composition in the Raia stream and the abundance of M. salmoides > 150 mm in TL was the best biotic predictor of endemic assemblage composition. 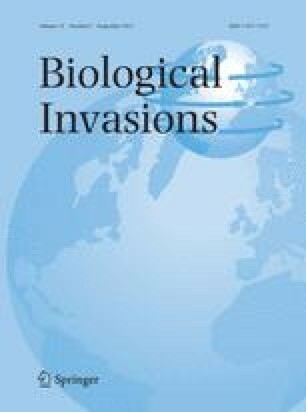 The total variation in the community of endemic fish was partitioned into four components: (i) associated uniquely with exotic species - 12.6%, (ii) associated uniquely with habitat variables - 27.6%, (iii) associated both with exotic species and habitat variables - 14.5%, and (iv) that unexplained - 45.3%. A significant association of exotic species with the endemic fish community remained after accounting for the selected environmental variables and a strong (habitat) x (exotic species) interaction was indicated.